Slow smoked with hickory and maple hardwoods for an old-fashioned taste that's getting harder and harder to find. Nodine's doesn't add any water to their cure, so the bacon doesn't shrink away in the pan. Just heat to crisp and serve. 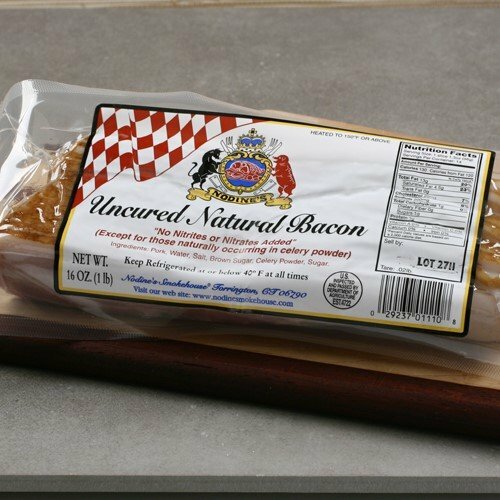 The same great bacon taste you expect from Nodine's, with No Nitrites or Nitrates added (except for those naturally occuring in celery powder). Nodine's Smokehouse Inc. was started back in 1969 as a small custom smokehouse in Goshen, Connecticut. Over the many years of hard work and dedication, this small family business outgrew the small processing plant located at the farm in Goshen. In 1989, the company moved to a remodeled and modernized facility. At the new production and shipping facility, while using the finest U.S.D.A. inspected ingredients, Nodine's has been able to capture the Old World Gourmet quality and flavor that's missing in most high volume facilities, while consistently maintaining high production.